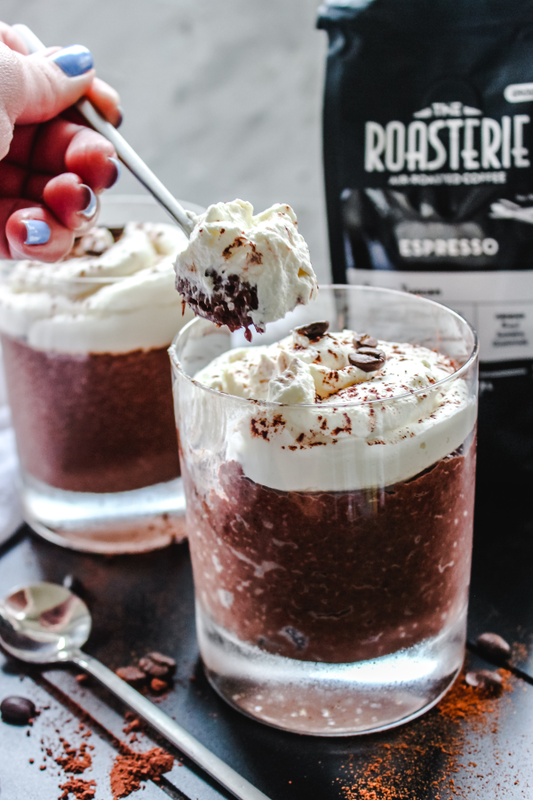 This recipe was created in partnership with The Roasterie. All opinions are my own. I am a self-proclaimed coffee snob and I’m totally ok with this. If you have never had the pleasure of tasting real, freshly roasted coffee beans, you have been absolutely missing out.When I moved to Kansas City, I was so thrilled to find multiple coffee roasters in the area, and have truly fallen in love with what the Roasterie creates and who they are as a company. I have been to their factory on two occasions, toured their facility, and sampled so many of their lovely beans and cold brew products. 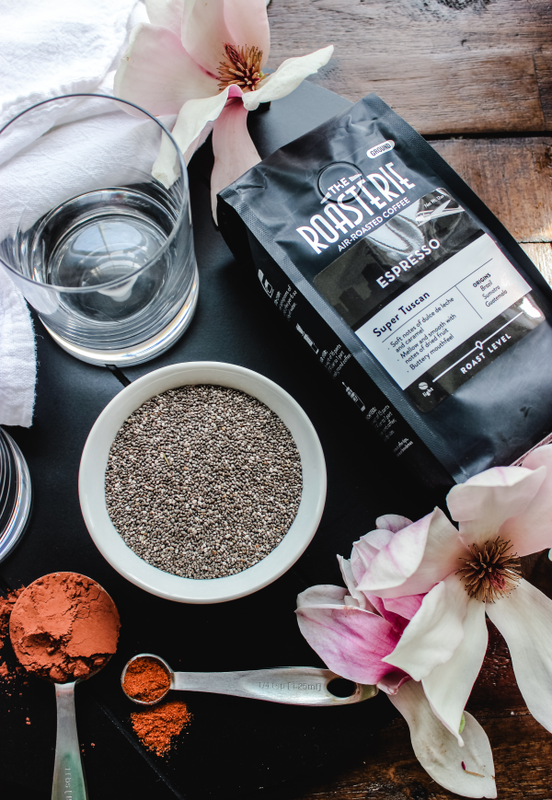 So, this coffee snob was absolutely thrilled to team up and collaborate on a fun Roasterie inspired recipe. 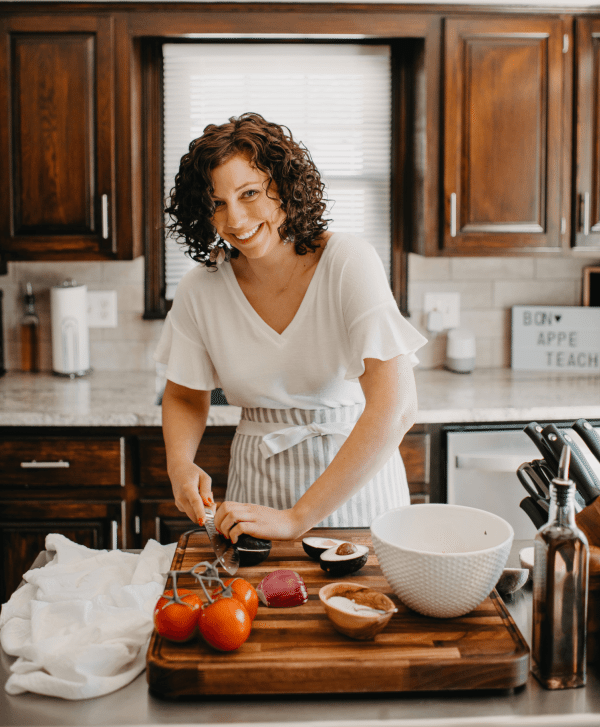 Despite knowing how to brew the perfect cup, I really loved the idea of incorporating my addictive need for caffeine into a great breakfast treat. Chia Pudding. 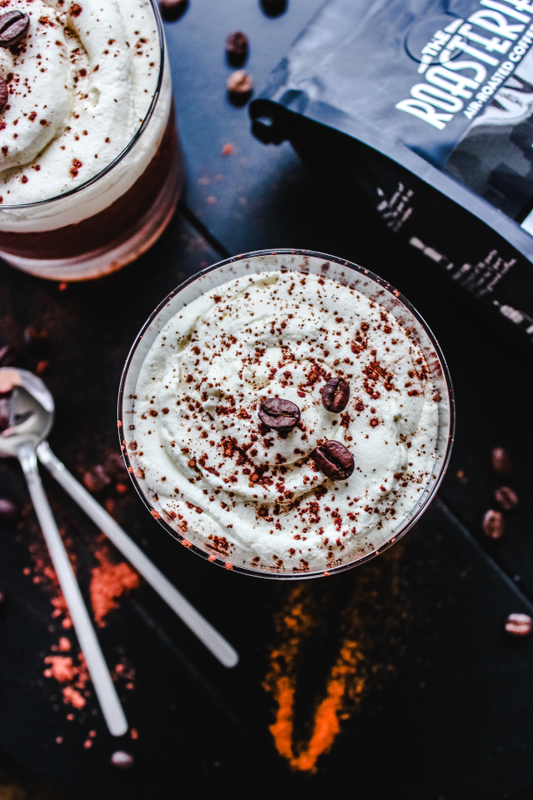 This recipe takes inspiration from a spicy Mexican Mocha. It features freshly brewed espresso, rich cocoa powder, and a little cayenne to bring the heat. 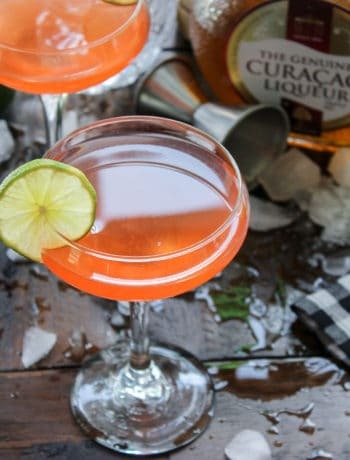 This is definitely one of my new favorites and I hope you give it a try! 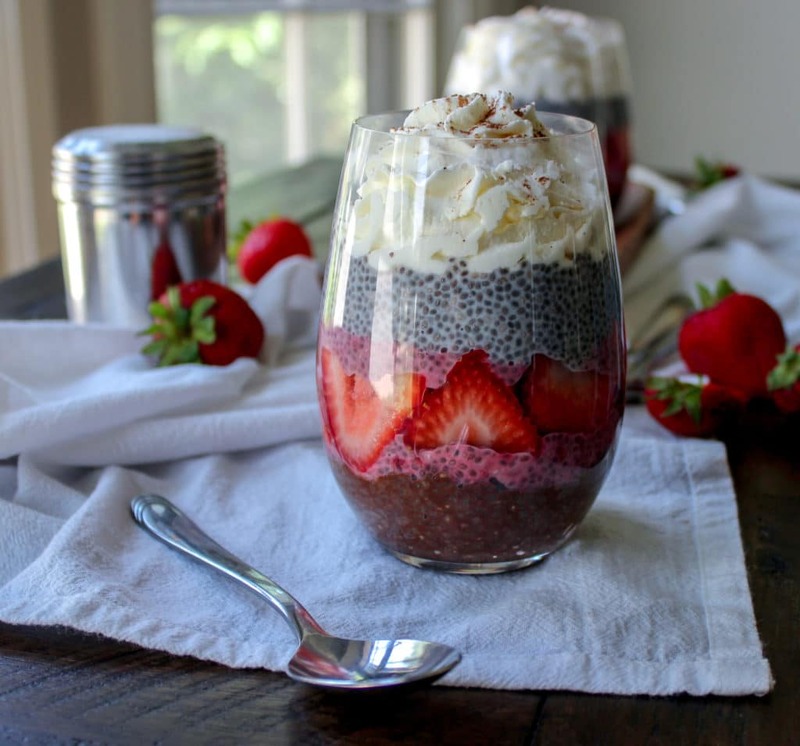 Chia seed pudding is honestly a fast and easy breakfast option. What I love is that it only takes about 5 minutes to prep and can even be done the night before if you like to meal prep. This works great with the espresso (gives it an extra zing), but works well with strong coffee in general. If you have leftover brewed coffee, now you know what to do with it! All you need is to combine everything in one big bowl and whisk it all together thoroughly. I liked the addition of the hot coffee to the chia seeds because I think it helps soften them fairly quickly too. To bring in the Mexican Mocha aspect to this, I used half and half along with the coffee. 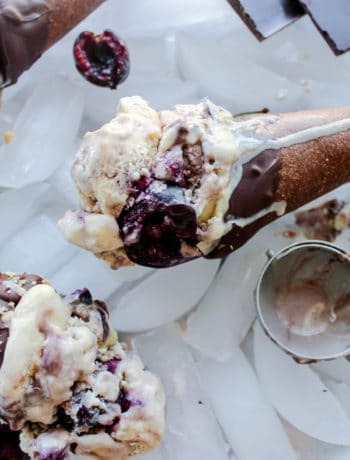 This creates a rich and creamy final product. If you want a dairy free option, use a coconut, almond, or cashew milk instead. No mocha is complete without the cocoa powder. I cannot stress enough how important a good quality cocoa powder is. It’s definitely noticeable in the final outcome so don’t skimp! Additionally, I added a little cayenne pepper to really spice things up and bring the heat. If this isn’t your preference it still is delicious without it too. After mixing is complete, simply divide it into cute jars or glasses and allow it to set for about 10-15 minutes in the fridge or at room temperature. It will work great as well if you want to leave overnight. Just keep in mind it might be a little thicker. 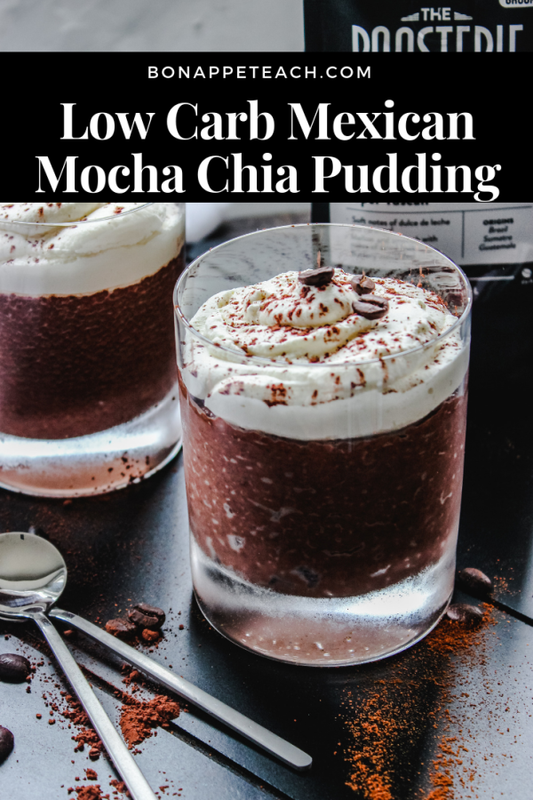 Serve this up with a nice, heaping dollop of low carb whipped cream, a dusting of cocoa powder, and maybe a coffee bean or two too… Full recipe is below! 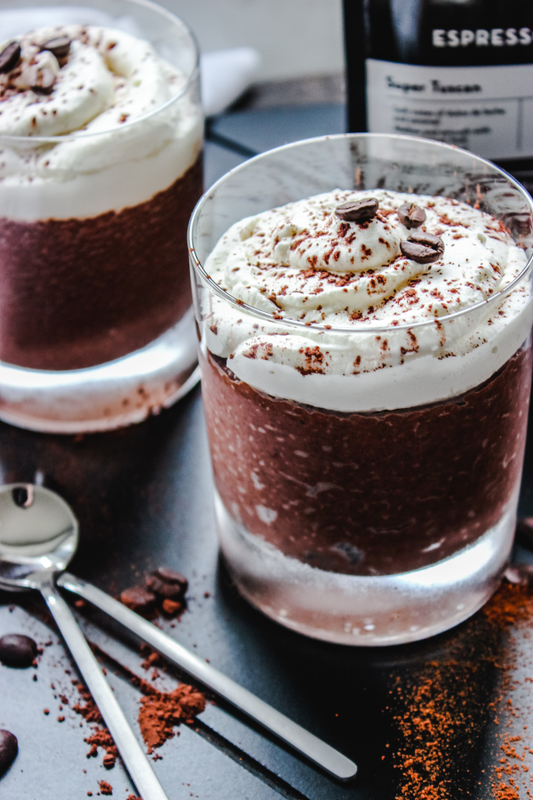 If you’re a chia pudding fan, make sure you also check out my popular Neapolitan Chia Pudding too! A little spicy, a little sweet, and a whole lot of low carb deliciousness. 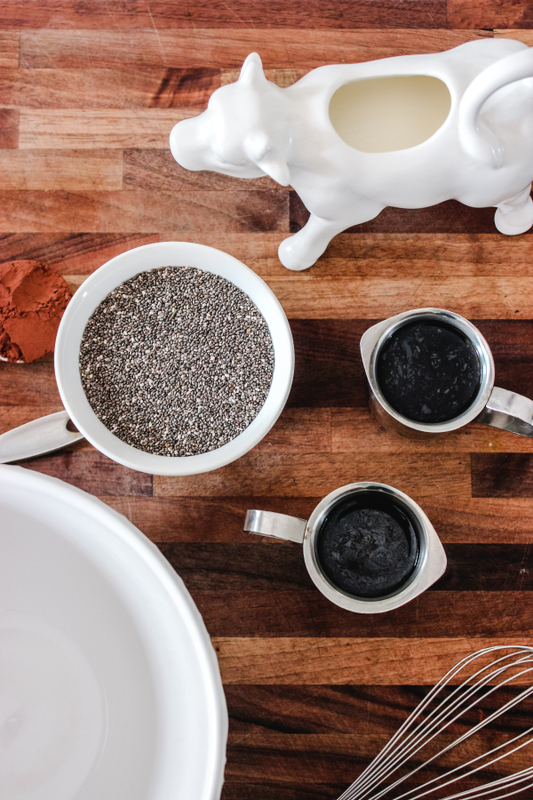 This easy chia pudding is a great way to have your coffee and eat it too. In a mixing bowl, combine all the ingredients and whisk thoroughly. Divide the mixture into 4 jars or cups. 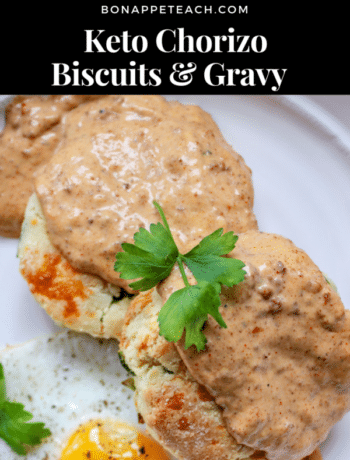 Let rest 10-15 minutes or refrigerate overnight. Serve with whipped cream and dusted cocoa powder.